Rheinfels was a new entity for Hesse, one that was situated near the Rhine in the west of Hesse. Its castle had been built in 1245 by Count Diether V of Katzenelnbogen. It soon developed into one of the mightiest fortresses in the Middle Rhine region. Only ten years passed before it successfully withstood the onslaught of a strong army sent by the League of Rhenish Cities and it resisted the ensuing siege for more than a year. Over the next few centuries, the original customs castle was turned into an increasingly important administration centre for the counts of Katzenelnbogen. They became one of the leading families along the Middle Rhine. After the construction of Neukatzenelnbogen Castle (today simply known as 'Katz') on the other side of the Rhine in the fourteenth century, Rheinfels Castle became even more important, as the counts were now able to block the river valley. 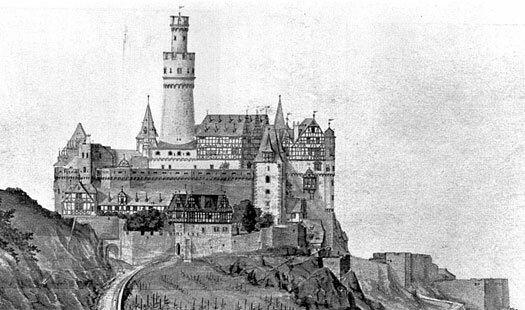 In 1479, when the line of Katzenelnbogen counts died out at the height of their territorial power, ownership of the castle passed to the House of Hesse. Granted as a cadet territory in 1567, its initial ruling line died out quickly. The title remained empty for forty-four years before being granted to Ernst, one of the younger brothers of William V of Hessen-Kassel. Upon the death of another of the brothers, Hermann, Ernst was able to unite Rheinfels with Rotenberg and then ensure that his increased holdings were again sub-divided upon his death. The minor title of Hessen-Rheinfels-Wanfried was created for his younger son, Karl, who nevertheless remained a subject of elder brother William, landgrave of Hessen-Rheinfels. Third son of Philip I of Hesse (numbering continued). The Ydulfing line of Hessen-Rheinfels dies without a successor. Philip's elder brother, William of Hessen-Kassel, claims back the land and properties but the title remains vacant for the time being. Landgrave Maurice has lost much of Hessen-Kassel's territory to the Imperial army and Hessen-Darmstadt during the turmoil of the Thirty Years' War and the family are in financial straits. He steps down in favour of his son, William V, and Hessen-Eschwege is created for one of Maurice's younger sons (out of a total of at least six sons). Hessen-Rheinfels is recreated along with a new creation, Hessen-Rotenburg, as cadet branches for two further sons while William succeeds to the landgraviate of Hessen-Kassel and retains overlordship rights over his younger (half-) brothers. Hermann is granted Hessen-Rotenberg while Ernst gains Hessen-Rheinfels. Hessen-Rotenberg. Son of Maurice. No heir. Hessen-Rheinfels. Brother. United Rheinfels & Rotenberg. The Marburger Succession Conflict between Kassel and Darmstadt is a result of Kassel claiming back both Rheinfels and Marburg (the latter in 1604). An enemy of Kassel during the Thirty Years War, Hessen-Darmstadt fights some of its bitterest battles against its neighbour. Darmstadt gains power after the war and the Peace of Westphalia (1648), a portion of Upper Hesse, the former Benedictine territory of Hersfeld, and part of Hessen-Marburg. The Rheinfels and Rotenbergs revert to Catholicism. The Rotenberg title is united with that of Rheinfels. Castle Rheinfels is the only fortress on the left bank of the Rhine that is able to defend itself against attacks by the French troops that have been sent by Louis XIV. Ernst's elder son, William, continues to govern the House of Rheinfels-Rotenberg. His second son, Karl, is created Landgrave of Hessen-Rheinfels-Wanfried (which title survives between 1693-1731). William of Hessen-Rheinfels-Wanfried dies without having produced an heir to his title. The title lapses. 'Rheinfels' is removed from the family title, simplifying it as Hessen-Rotenberg. The turbulent history of Rheinfels Castle comes to an end in 1794, when it is handed over - without a struggle - to the French revolutionary army. In 1796 or 1797 the exterior walls and the castle are blown up. Today the castle survives as a ruin. The Rheinfels territory is lost to the revolutionary French. Son. Also Duke of Ratibor & Prince of Corvey. Victor produces no legitimate offspring, so the Hessen-Rotenberg male line dies out. Marie had married Karl August, Prince of Hohenlohe-Bartenstein in 1811, so with her death, the title passes out of Hessian descent.